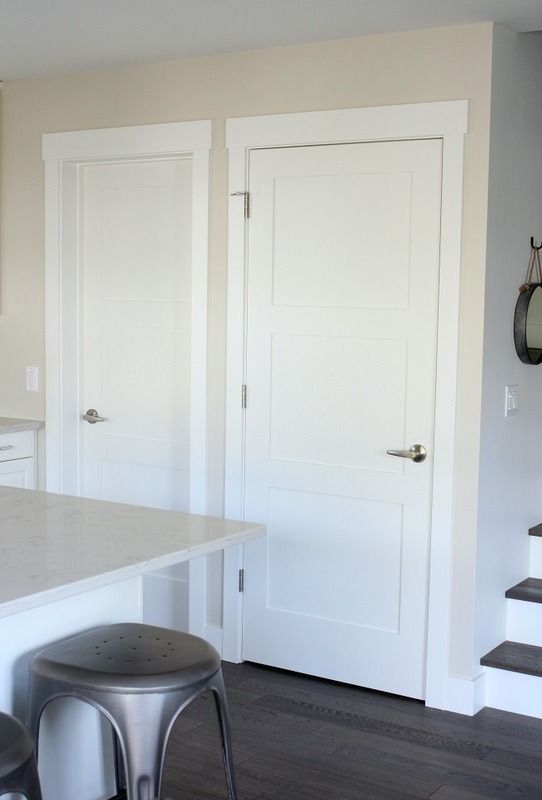 Installing shaker style trim and doors throughout our entire main floor made everything look so bright and fresh. You won’t believe the difference! Hello, friends! After loads of questions (and as promised), I’m sharing more details of our main floor renovation. 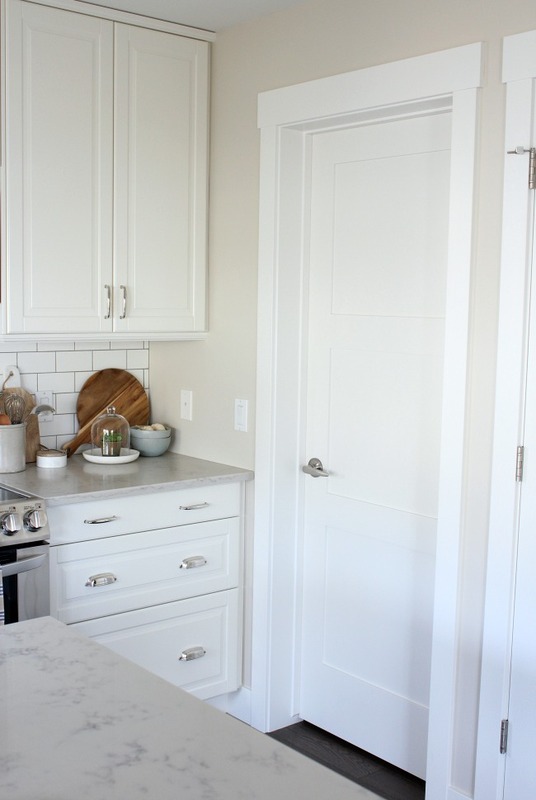 Today, it’s all about our white-painted shaker style trim and doors. To begin with, let me give you a bit of the backstory. While looking to move to the town we currently live in more than a decade ago, the selection of homes for sale in our price range was very limited. It was at the very start of the housing boom when everything was just starting to take off. After searching around, nothing was checking our boxes completely, so we had to go with the best option we could before inventory was even more limited or prices became far too high for what we could afford. The home we ended up going with was a builder’s spec home in a very good neighbourhood. Although we were relieved to have found something, I was less than enthusiastic about some of the finishes in the house. From the moment we moved in, there was a very long list of changes we wanted to make, and the trim was definitely near the top of the list. Picture skimpy oak baseboards and door casings in a reddish-orange stain. Yuck! Unfortunately, they made every room in our house feel quite dark and closed in as you can see in the pre-reno kitchen photo below. I’m someone who knows white paint can be a miracle worker, but even it has its limitations at times. Who knows, painting that existing trim may have even made it look worse. I wasn’t going to give it the time or effort to find out. So, if our trim was really that terrible, why did it take us so long to change it out? Over the years, life in our home carried on with small projects here and there, but busy schedules meant we never quite found the time to tackle bigger ones. Like many families, we spent our time in the hockey arena, helping with homework, making meals, doing laundry, walking the dog, travelling for work… you get the picture. Somehow, I learned to look past the ugly details of our home, keeping in mind that someday we’d address every single one of them. After years of patience saving up the money and, finally, setting aside the time, we decided to renovate our entire main floor at once. 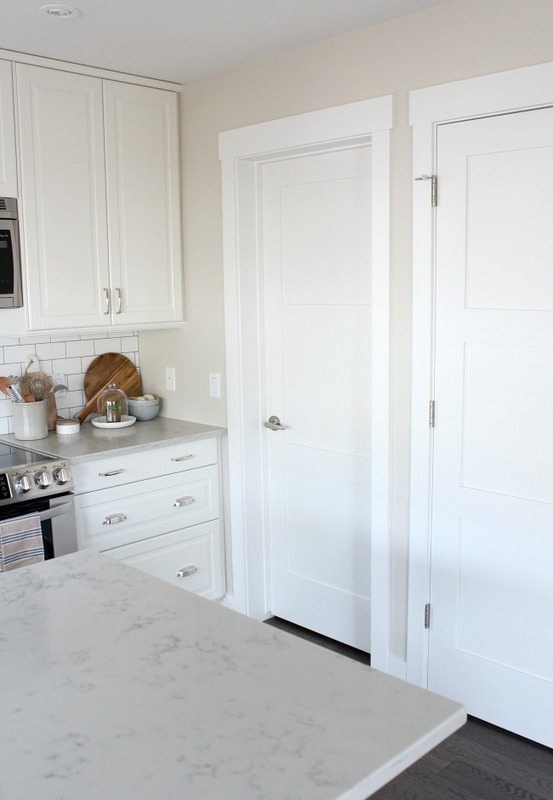 We installed flat stock MDF in a shaker or craftsman style to match our new 3-panel doors. It’s the same classic look we selected for our basement development we tackled a few years earlier. Keeping styles consistent throughout a home helps to create good flow. Keep that in mind when you’re planning your own renovation. 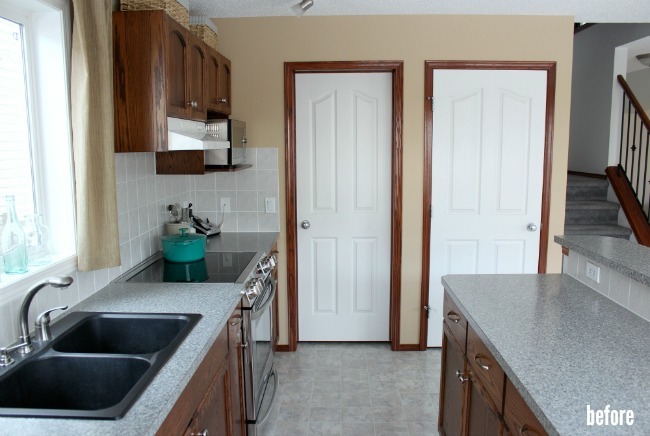 As part of our design plan, we increased the size of our baseboards and window casings too. See sources at the bottom of the post for measurements. 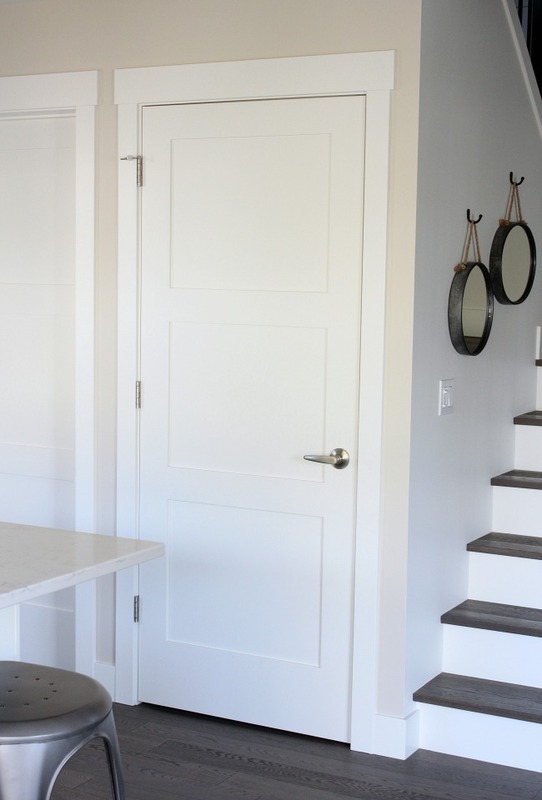 These kinds of small tweaks freshen up a space and elevate it to new heights. Quite often, it’s these simple details that end up yielding the best return on investment. 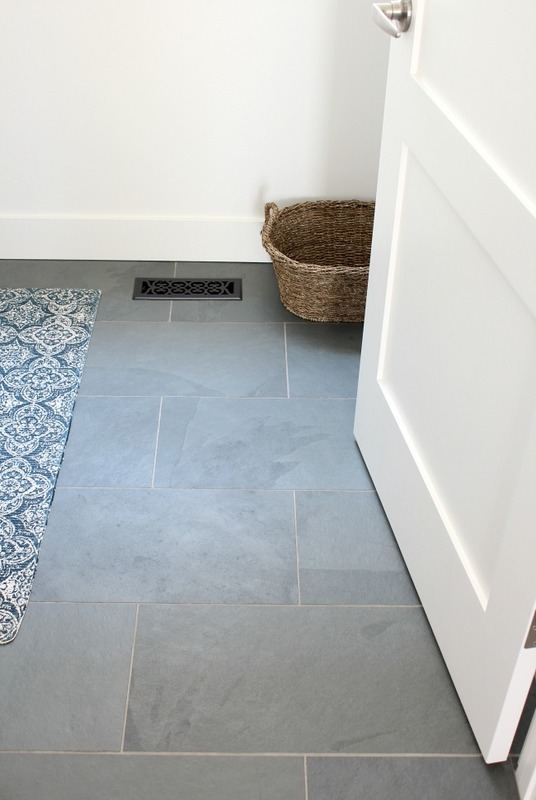 I love how the baseboards pop against the white oak hardwood floor, as well as the Brazilian slate tile floor we installed in the entryway, powder room and laundry room. It’s the contrast I was looking for. 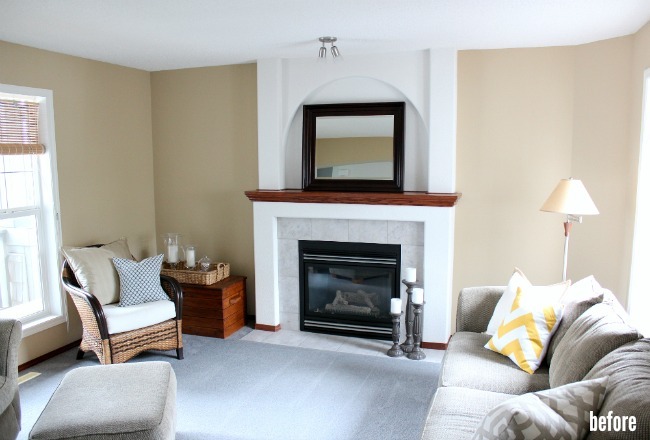 One of the biggest transformations we made to our home during our renovation was updating our fireplace. Being the focal point of our living room and one of the spaces you first notice when you walk into our home, meant it was important to get the design right. As you can see, our fireplace had far too much going on before with the arched top, textured finish, and red oak mantel. It was definitely a focal point, but not in a good way. After covering over the textured surface and filling in the arch with new drywall, we created beautiful fireplace details using MDF, crown moulding, casing and stop. 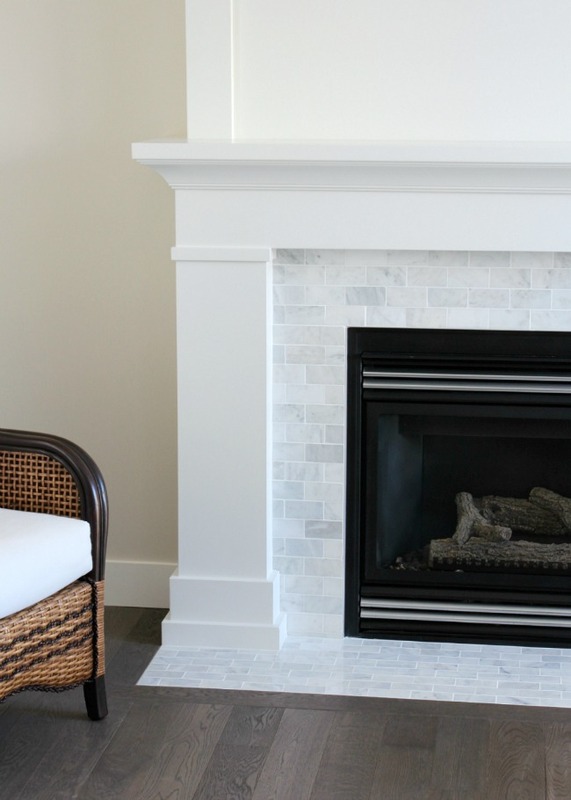 Once everything was painted out in white, our fireplace gained the depth and visual interest it once lacked. With careful planning, you can definitely achieve a high end look without investing big in materials. I believe our fireplace project is a good example of that. 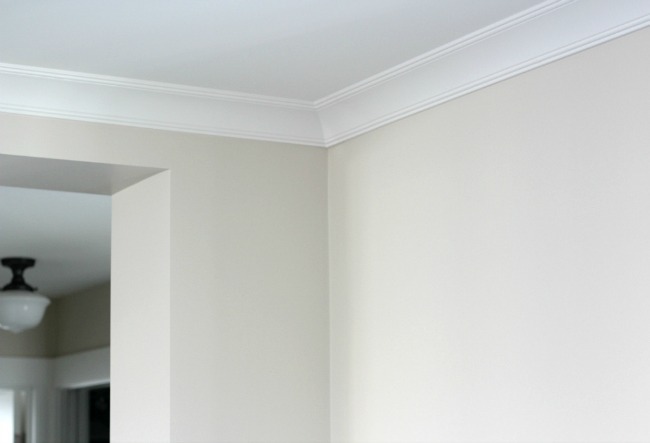 To create a seamless finish, we took the same style crown moulding we used to create the mantel and carried it around the ceiling perimeter of the living room. It made the room look grown up. Funny how a small change like that can be so drastic. Getting rid of the popcorn ceiling helped too, especially since it’s only 8 feet high. No matter the time of year, our living room looks bright and fresh. 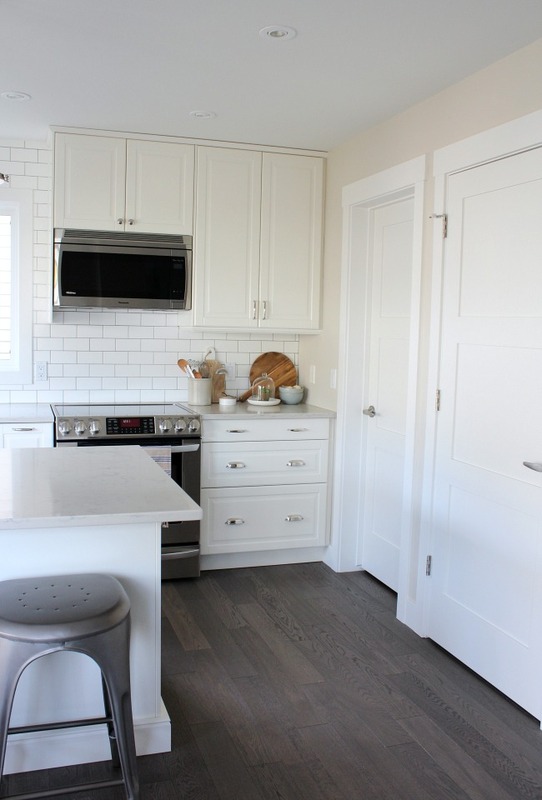 Our new shaker style trim work has definitely breathed new life into our home. I’m no longer restricted in my decorating choices, worrying if the space will be too dark or whether or not the colours will clash or patterns will be too busy. Instead, we have a beautiful backdrop with oodles of possibilities. I guess waiting all those years was worth it in the end. Do you have any big renovation projects you’re saving for? Planning on changing out your trim and doors? Tell me about it in the comments! And, of course, you can find more sources on the Shop Our Home page. How much over hang on the top trim over door? Hi Shauna! This looks fantastic thanks for the inspiration. Did you match your window casings/trim to match your doors? Thank you! Yes, we did do the same as the doors for the windows. Except for the window above the kitchen sink which has subway tile around it so we went with simple mitred corners in the casing size. Wow! Looks beautiful, great job!